Summer might decide not to arrive on this island this year but I refuse to be put off. I have been making ice cream. If I have to eat it in the rain with 15C degrees out there, then so be it! Slice strawberries into a bowl and sprinkle with sugar and liqueur. Leave to infuse for a few hours. For the custard, pour milk and cream into a saucepan, add salt and vanilla and cook over a low heat. Whisk egg yolks with sugar. When milk is about to start to boil, lift from the heat and trickle some milk over the egg yolks. Keep whisking and adding the milk. Heat the mixture over a waterbath until it starts to thicken, whisking all the time. When it coats the back of a spoon, lift off the heat, cover and let cool. Mash the strawberries using a fork. It's okay to leave some chunks in there. Pour the custard into an ice cream machine and chill until just about ready, then mix with the strawberries. If you don't have a machine, then just skip this step, it will be fine. 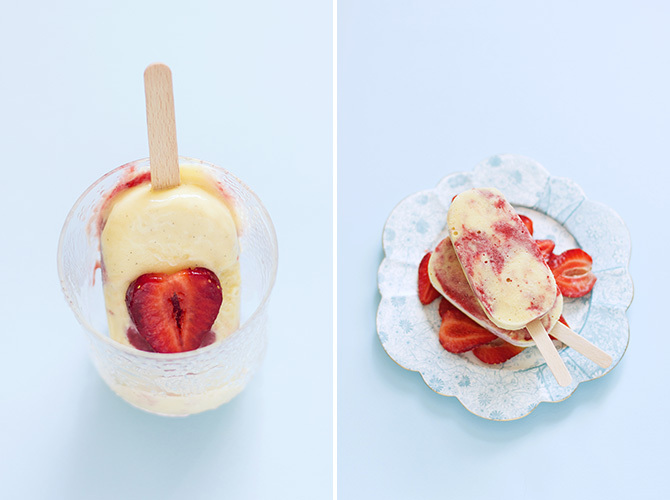 Fill popsicle moulds with streaky ice cream. Pop in the wooden sticks and chill in the freezer.